Here comes the defining moment in Afghanistan’s infamous war; 11 deadly years of violence that has jeopardized the entire region seems closer to a reverse tide as US faces a deadly situation post recent ‘massacre’ by its rogue staff sergeant at the pre-dawn of 11th March. Sixteen Afghan civilians including 9 children and women along with elderly men were killed being shot in the face at point-blank range. Corpses were later burnt allegedly by some highly inflammable chemical. This crater for US forms very close to an already dark abyss where US policies fell last month after the burning of Holy Qur’an, resulting in deadly reprisals and anti-American sentiment taking strong hold in every nook and corner of Afghanistan. The ‘terrorist’ belonged to Lewis Mc-Chord which is considered as one of the largest American military installation in US with a horrendous reputation of violence, “The most troubled US base ever” as a military site “stars and stripes” calls it. Some of the soldiers deputed by this facility were involved in civilian killings in Afghanistan back in 2010. Four to five soldiers were convicted of one of the most brutal charges where one of the convicted staff sergeant acknowledged cutting out fingers and tooth of the victim to keep them as war trophies. Suicide rates due to post-traumatic stress disorder are also high at this base which has largely been involved in violence both domestic and in war-theatres outside US. Recently 3rd Brigade, 2nd Infantry division of this base sent about 2,500 soldiers to Afghanistan in December for a yearlong deployment. The brigade had deployed to Iraq three times since 2003; this is its first deployment to Afghanistan. The alleged assassin was deputed with special-forces in Kandahar along Navy-Seals or Green Beret units for village stability missions for first time after his three ventures in Iraq. His precision in firing on the fore-heads of children flattens the assertions of ‘being drunk’ or having ‘mental ailments’ as no soldier is recruited after routine medical check-ups. As reported he later returned to the base and is being held by fellow authorities. This brutality was carried out at the Alokozai village, in the Zangawat area of Panjwayi district near 3:00 a.m. when an alleged group of US Special force was out for the bloodiest of murders ever in the history of Afghanistan. According to live accounts and eye witnesses multiple weapon sounds were heard, including pistols and machine gun bursts simultaneously. The houses attacked are at least 2 miles apart and it becomes literally impossible for a single gunman to kill and burn people in one house and then run few kilometres to do the same thing again. Eleven dead belonged to a same family and nine of the victims were children, including infants found soaked in blood close to the bodies of their mothers. Afghan sources in Pajwayi claim to have photographs of half-burnt bodies of women and children as blood-spattered walls and floors have already been aired in the media. Some local villagers have reported seeing two groups of soldiers. The Afghan defence ministry also believes in its initial assessment that there is a possibility of one or more soldiers being involved. Afghan President Hamid Karzai also believes in the possibilities of more than one soldier as he quotes in his statement a 15-year old survivor ‘Rafiullah’ as telling him in a phone call that ‘soldiers’ raided the house and woke up his family members before shooting at them. ‘This is an assassination, an intentional killing of innocent civilians and cannot be forgiven’, Karzai said despite calls of condolences and shock from Obama, Pannetta and Jhon Allen. Everything seems to be falling apart for US strategists as they claimed to have made significant progress in negotiations for a strategic Partnership Agreement allowing US Special Forces and advisers to stay in Afghanistan for an indefinite period in order to protect the region from falling into chaos once the combat foreign forces leave in 2014. The agreement has apparently been delayed after this attack which saw a detention centre being handed over to Afghan authorities as its first phase or achievement. “This could delay the signing of the Strategic Partnership Agreement,” an Afghan government official told Reuters. The purposeless and unending war has turned the ‘pampered soldiers’ into humiliated zombies fighting for a respectable exit in a lost war which becomes impossible to achieve after this single incident. Each day of Afghan war theatre draws near a dramatic and unimaginable end for US and her allies that ransacked an already war-torn country, in fact a nation deliberately left in chaos post-soviet war in 80’s by the same ‘Super-power’ that once claimed to be friends of Afghans. Afghans have rendered enough sacrifices during the past decades, especially this last one. Their land was occupied, bombed by B-52’s; their men were brutally killed and taken to prisons around the world. Millions of Afghans have already lost their lives and loved ones at the hands of invaders who not only killed them, but disrespected their culture, heritage and values and above all their religion by desecrating the Holy Qur’an. As if death was not satisfying for the ego of the aggressors, there have been incidents where bodies were mutilated, urinated and devil-danced upon by ‘exceptional forces’ as Obama calls them. Latest, was an episode of unmatched abhorrence and disregard to poor Afghans who have always stood strong at the helm of tyranny. No word in dictionary can define and no word can repent this bloody night imposed on innocent Afghans sleeping peacefully only to be disturbed for few minutes of bloody nightmare; back to eternal sleep. One wonders what’s coming next for US and its forces as the hatred and vengeance has not only infused in ordinary Afghans, but apparently their own stooges in the government and trained army are uttering words of fire, blood and vendetta. Heart wrenching stories continue to flow out of Kandahar explaining accounts of this gruesome and unforeseen bloody rampage, shaking the core foundations of humanity and leaving no doubts in the mind of world about the psychological condition as a result of legitimate Afghan resistance against occupation forces in Afghanistan. Presidential statement from Karzai’s office has termed this incident as “unforgivable”, Taliban as expected have vowed for decisive response and termed the US forces as, “Sick Savages” liable to be killed wherever found and the already boiling blood of ordinary Afghan’s on the issue of burning Qur’an has now turned into a volcano whose ashes are easy visible from the balconies of white-house. A republican presidential candidate Newt Gingrich said in an interview to the “Fox News” that it was time for U.S. troops to leave Afghanistan. He considered the mission in Afghanistan as “undoable”. “It’s very likely that we have lost — tragically lost the lives and suffered injuries to a considerable number of young Americans on a mission that we’re going to discover is not doable,” he said, adding in an interview on CBS’ “Face the Nation” that the U.S. doesn’t have the “willpower” or the “capacity” to “fundamentally change the region. Tragedy of Kandahar will always be remembered as the most brutal face of oppression. US forces have long taken motivation from their ‘9/11 we will never forget’ phrase; and 3/11, Afghans will never forget! The irony of our times is that truth is never revealed & what is revealed is a bunch of lies to hide the gruesome face of reality or partial truth to further twist the picture. What’s going on worldwide in the name of this war is more messed up than anything human history has ever unveiled. The atrocities humanity has underwent is unique in the way that the populace don’t even know the truth behind it despite living in the same global village (Examples are dispersed from Palestine to Iraq). But now the stories that will come out after another Superpower leaves this region will be unbearably painful. Prophet Muhammad SAW surely warned of such times. May Allah Help Us All. America has a long history of such atrocities In Vietnam many people were slaughtered by American Troops but because in those days we did not have 24 hour News much less was known. Many incidents have been spoken about decades later. In Iraq, abuse and murder was committed many times and were exposed on Wilkileaks. The Americans, who themselves have no morals, do not realise that in places like Afghanistan this massacre will be remembered for generations because unlike Americans, Afghans have hearts and morals. May The Amighty Bless these men, women and children who have paid the ultimate price for Americas’ ‘War on Terror’ by dying at the hands of an American Terrorist and may He also Bless their families. remember..todays tears are the weapons of tomorrow..these sons of apes are digging their own graves by commiting these atrocities..May Allah SWT bless those who are striving in the cause of Allah to liberate the muslim lands from these barbaric oppressions.. I knew who she was talking about. Sara bibi who you’re talking about? But why did the American killed those people and burned them? Mother is standing by the door, holding a glass of water, wiping tears from her face, mumbling, why were you showing those pictures to the children? It was incorrect, but pay attention my dear! We have to teach them, we have to teach them, we have to let them know what is going on in our motherland; we have to let them know who they are, we have to educate them. 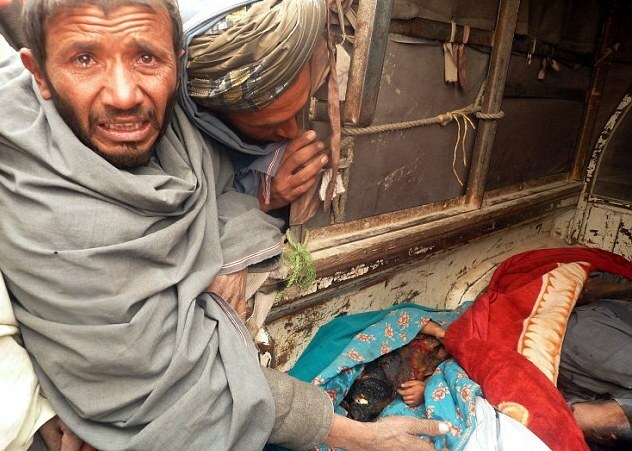 Oh, Tragedy of Kandahar will always be remembered as the most brutal face of oppression.